Th-INK-ing of You: A Sneaky Peek! Hello sweet friends! I hope all my American friends had a happy Thanksgiving and that you didn't eat too much turkey! LOL! I know all of us here did!!! I wanted to share a quick sneak peek with you because I just love the new stamps from Our Daily Bread designs that will be releasing tomorrow and had to share some with you! 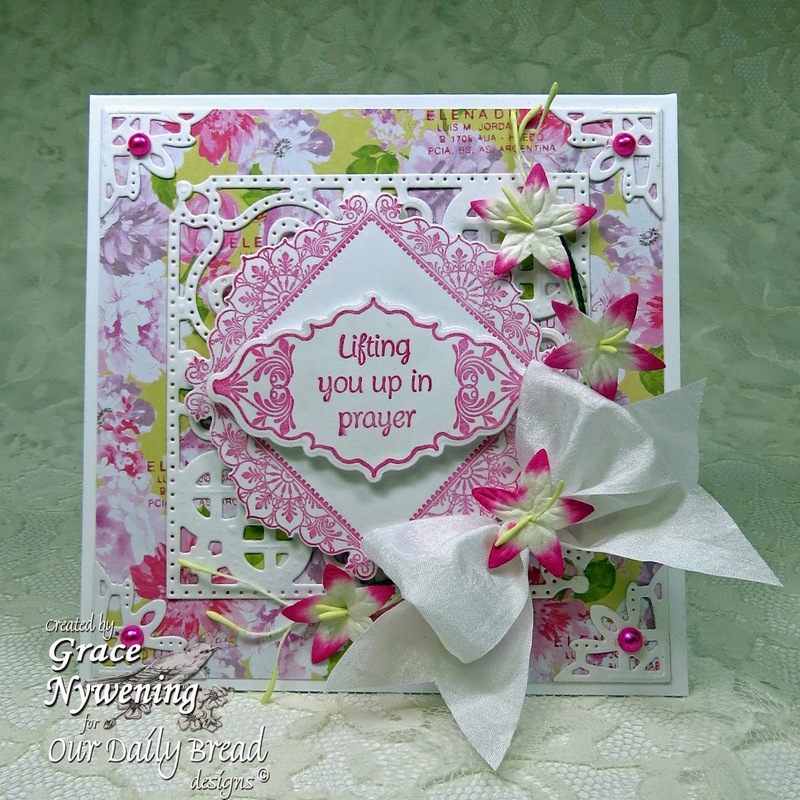 This card was made using a set called Ornate Borders and Flowers, the ODBD Custom Ornate Borders and Flower Die, and also from a past release, Decorative Corners dies. I also used a past release, Mini Tags 3 for my sentiment. Don't you just love how these new borders layer with eachother? The dies cut these borders beautifully and I know you will love these new sets. I can't wait to show you more!!! My ink for this card is VersaColor Pigment ink and I used this gorgeous designer paper from Prima called Meadow Lark on a base of white. I added a little bling, some Wild Orchid flowers, and a white silk bow from May Arts. Weekend Sale and it's AWESOME! So check it out at THIS POST! It's good through 11pm Dec. 2!!! Oh, Grace, this is absolutely gorgeous…and such a tease for the new release! Can't wait to see it all tomorrow! I love the beautiful colors, the DP, and all the lovely embellishments! 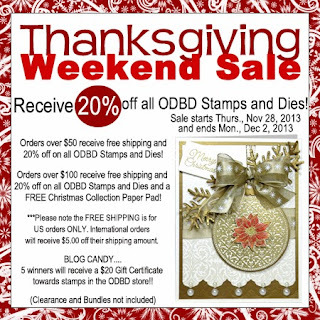 And I love how you've used the wonderful ODBD dies! And the finishing touch of the ribbon and flowers…well, it's all perfection and a delight to my eyes! Hugs, precious friend! Oh Grace this is stunning - love every little bit of it - so elegant and feminine. Fabulous colors and design, I love this.